London (AFP) - The gentle neighing of horses, some chewing on fodder, some being saddled as trains trundle past sounds like an idyllic rural scene in England -- this though is the Ebony Riding Club in south London. The riders too are not your normal pony club youngsters. Children of all ages, some with behavioural problems and some of the most disadvantaged in the capital, are largely drawn from Brixton, an ethnically diverse area of south London with a large West Indian community. 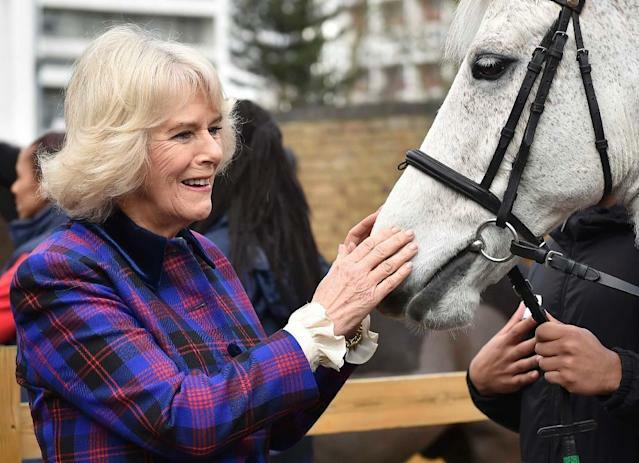 The club, which is overlooked by tower blocks on one side and a railway line on the other -- is a world away from Royal Ascot but it enjoys the enthusiastic patronage of Prince Charles's wife Camilla. She has been involved since 2009, two years before the club moved into its cosy, impressive premises in Brixton. 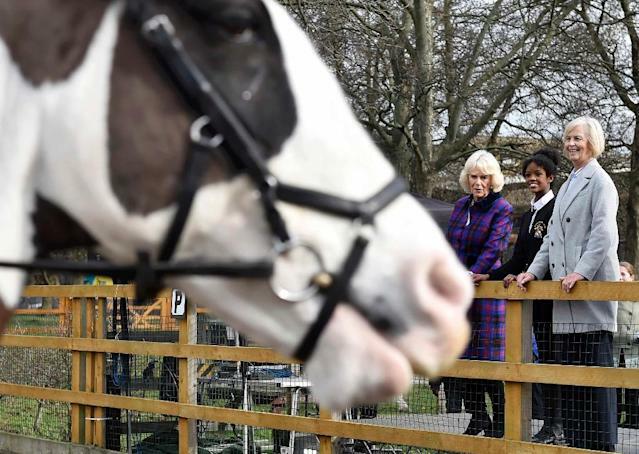 Much to the pleasure of the staff and children, she even once brought along her mother-in-law Queen Elizabeth II -- a noted lover of horses -- for a visit. For many of the children, Ebony, which costs Â£400,000 ($525,000) a year to run, is an oasis and one that has developed hugely from when it first started in 1996. Children can spend a few hours not just riding the horses but also performing the less glamorous tasks of mucking out stables. Some get so taken by it that they go on to pursue a career in racing while others hold different ambitions. Abdus, a very mature 14-year-old, rode in a pony race at Ascot last year and recently spent a week at top trainer James Fanshawe's stables which he told AFP is the best he has visited. "This place (Ebony) is a really important place for some of the people as there is a lot of gang things going on in the area," says Abdus. "Kids that live in these areas don't necessarily want to be members of a gang but if this place wasn't here there would be peer pressure." Abdus, who would like to be an accountant to a trainer, says the difference between Ebony and other riding clubs in London is they take an active interest in careers. "This place gives you opportunity of work experience, you come here every week they look after you," said Abdus, whose two sisters are also enthusiastic members of the club. "Here they care about you and your education and follow you till you are 25 and get you jobs for the future." One of the club's two youth workers Radhika Nagar knows first-hand how horses can help those who have troubled upbringings. "A love of horses helped me as a child as I had a difficult background," she told AFP. "Horses are like another human who can feel, touch you and smell you. "They can sense how you are feeling, whether it is a good day or a bad day." David Fleming, the club's Engagement Manager, says his mindset about the impact horses have on children has changed markedly since he arrived with Naomi Howgate as part of a new management team a year ago. "I was a little bit cynical a couple of years back about how therapeutic horses could be in improving people but this has been an eye-opener," he told AFP. "One of the kids as an example has been coming here for 4-5 years. "When he first came here he couldn't speak or make eye contact with anybody and people thought this guy has issues but a youth worker who works here helped him. "He is now a different person and is keen to get a job in the racing industry," added the Irishman. Howard says he has learnt to adapt his behaviour in daily life from interacting with the horses. "One time I got pulled over at school for something I didn't do," he told AFP. "That really annoyed me but I thought to myself I will stay calm like when my horse refused a fence. It has helped me a lot with my behaviour." For Zoe, another 14-year-old, her life has completely changed since she began volunteering at the club -- she goes there four or five times a week -- and has set her sights on becoming a vet. "My friends are most probably sitting at home not doing too much or out with their friends," she told AFP. "I prefer it here as it keeps me out of trouble and l know I am safe here. "If you have problems outside of Ebony you just drop them off at the gates."